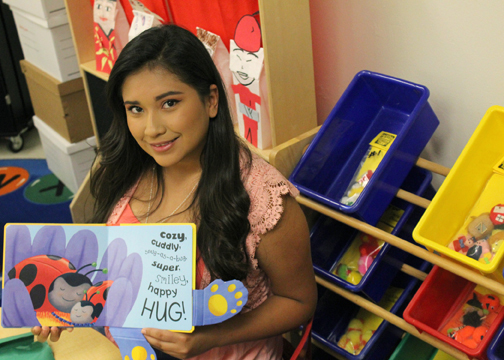 (HARLINGEN) – Anahi Reyes is an Education and Training student at Texas State Technical College. She holds a 3.0 grade-point average and hopes to earn her associate degree in Spring 2020. When the 19-year-old Harlingen native is not studying or volunteering on campus, she is teaching Confraternity of Christian Doctrine (CCD) classes at a local Catholic church, Queen of Peace. After I graduate from TSTC, I plan on transferring to Texas A&M-Kingsville to pursue a bachelor’s degree in education. My dream job is to become an early childhood or elementary teacher. Teaching has always been a passion of mine. Even when I was small and I played school with my friends, I HAD to be the teacher. My greatest accomplishment so far was finishing my first year of college with a decent GPA, but I know there is more success to come. The lesson I have learned is that to get what you want and to achieve your goals you have to study and work hard. Nothing worth having comes easy. The person who has had the most influence on my success is my Speech Instructor Juanita Amiel Townsend. She has taught me to be more confident in myself and how to calm my nerves when speaking in front of large audiences. I’ve taken her advice and used it in other classes and it is especially important to keep in mind since I want to be a teacher. My advice for future TSTC students is to keep an open line of communication with their instructors. All of the instructors I have encountered truly care about their students and are involved in making sure they succeed. They work with you.